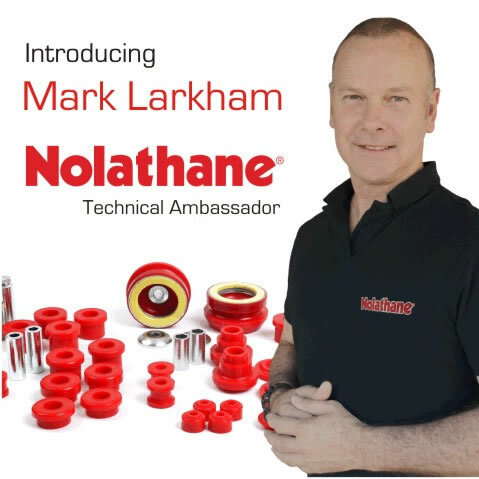 Nolathane suspension bushings synchronise your suspension system for optimal safety, handling and performance. They are the most positive link between your vehicle's springs, struts or shocks. By vehicle, part number or spec, start your Nolathane search here via our user friendly online catalogue. FREE online training portal for the industry. From diagnosing failed suspension components to FAQ's, Nolathane’s technical portal is rich with technical content. A short fall of the modern day IFS 4wd is the adjustment range provided for successful wheel alignments, this becomes even more of an issue when the vehicle is lifted by more than 1 inch. Not only does the vehicle run into camber and caster issues, but ball joint articulation and clearance issues to the coil over strut at ride and droop height. The new Nolathane offset UCA (Upper Control Arm) is an all-in-one solution to these issues. Featuring built in increases to camber and caster angles, greater clearance to the coil over strut and more articulation of the arm by virtue of new maintenance free GIIRO bushing technology.